Convenience should be your number one priority when you go traveling. That goes for both: packing your stuff and carrying it around. And if you’re thinking of lugging along a sleeping bag, then I recommend getting the one that makes it convenient to carry around inside a backpack or type of travel luggage. In this post, I researched and reviewed the 5 best sleeping bags that can also be easily carried as a compression sack inside a backpack. These are perfect for casual campers, hikers, and backpackers who want a lightweight option that is portable and comfortable to sleep in. And to top it off: they are all under $100! 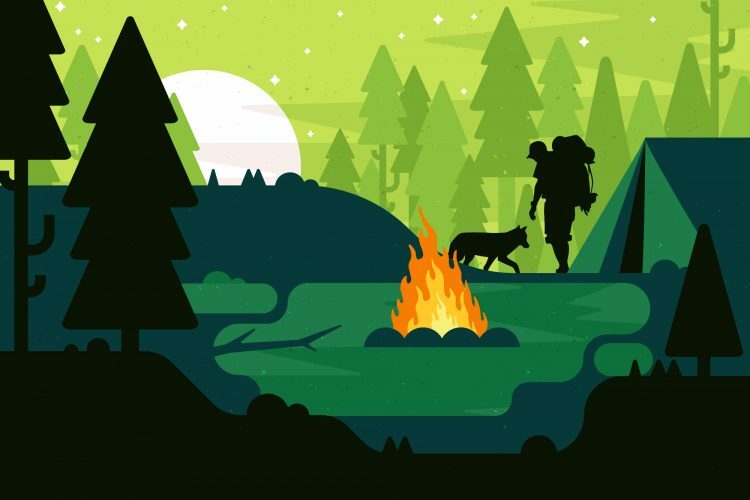 You can expect each of these sleeping bags to provide the comfort you need for sleep in the outdoors, while also being budget-friendly to your wallet. 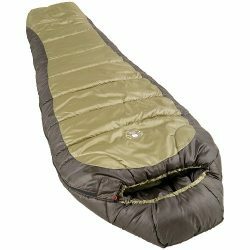 If you want a budget-friendly sleeping bag and compression sack combination that can handle those cold nights that can reach as low as 0 degrees Fahrenheit while being convenient to carry in your backpack, I recommend getting the Coleman Mummy Sleeping Bag. Like the name suggests this bag comes in a “mummy” style design that completely wraps around your body and head while leaving your face exposed like a hood. This ensures you’re both warm and comfortable throughout the night. In addition, it helps with trapping heat and handling those colder temperatures. The bag compresses into a cylinder that is 20” long and 10” in diameter while weighing 4 pounds and 6 ounces. You can easily fit this in large capacity travel bags or backpacks to ensure you’re not burdened with carrying around a separate sleeping bag. If you’re looking for a sleeping bag that you can take on the casual camping trip here and there, I don’t see a better choice than the Abco Sleeping Bag. It’s a lightweight sleeping bag that makes it convenient to take with you on your trip and its synthetic material will manage to keep you warm for most situations with its 20°F temperature rating. This makes it great for those summer night vacations when you want the full nighttime outdoor experience while still being warm and comfortable. And to ensure its comfortable, the manufacturer designed it with a larger size frame (86.6 x 29.5 inches) to accommodate most individuals. In addition, the sleeping bag is made to be waterproof to prevent any water or moisture that might occur when you’re sleeping in the outdoors. If you’re packing for a trip with family or a significant other than you’re going to need more than a single sleeping bag. 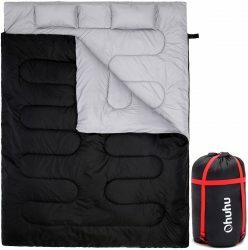 With that in mind, this double sleeping bag from Ohuhu is a great solution to making your travel much more easier. This 2-person sleeping bag is a great value as it has the option of sleeping two individuals together or splitting it into two individuals sleeping bags for other family members to use. In addition, for its price point it is built to battle the elements with its 210T polyester shell while also being comfortable to sleep in with its M2 3D cotton filling. 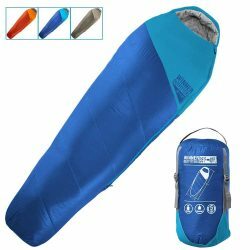 This sleeping bag is suitable to handle temperatures 32F and higher making it a great budget value for most family vacations and outings. Last, but not least is the compression factor of the sleeping bag. The Ohuhu can be compressed into a bag measuring 19.5” x 11” which can easily fit in most luggages or travel backpacks. You’ll be able to conveniently pack for your family without the stress of lugging along an extra sleeping bag in arm. If you’re looking for a lightweight sleeping bag that can easily fit into your backpack then I recommend taking a looking at this mummy sleeping bag from Teton Sports. It’s a great solution for backpacking and hiking where weight is important in how much you can carry. 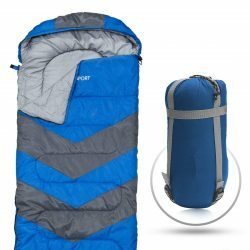 And if you need a causal sleeping bag that you can use every now and then for those summer camping trips this bag will keep you warm with a comfort temperature rating of 20-30 degrees. This will keep you comfortable and cozy throughout the night while still enjoying the benefits of the outdoors. This bag is suitable for those nights that reach 35 degree Fahrenheit but is designed to withstand temperatures of 20F. As for comfort when sleeping this sleeping bag has a 350T polyester lining that feels great against the skin and adds to the cozy factor when asleep. To top if off: the mummy style form factor wraps around your entire body to ensure more heat is trapped to keep you warmer during those nights while camping out. Subscribe for Carry All News & Deals!